The Western Sydney Airport (WSA) is a proposed second airport to be located about 50km west of the Sydney central business district. In addition to relieving congestion for the Kingsford Smith Airport, it will serve as a focal point of urban growth for south western metropolitan Sydney. Community engagement is an important process for providing and responding to community input into large-scale developments such as the WSA. To date there has been limited engagement with various communities and relevant stakeholders, such as affected local governments. Bringing a health lens to any community engagement strategies may help to improve health and wellbeing of communities. For this reason, it was decided to undertake a Health Impact Assessment (HIA) of community engagement for the WSA. The HIA began in June, 2015 and was completed in February, 2017. It was conducted through a partnership between CHETRE and Western Sydney Community Forum. It was supported by South Western Sydney Local Health District. Evidence was collected through literature reviews, community profiling and community workshops that provided qualitative evidence on the impacts of existing engagement strategies, and recommendations to improve engagement processes in the future. The HIA found that community engagement practices have been very limited and considered insufficient by most affected community members. Current engagement practices are impacting on important determinants of wellbeing, such as: access to information, feeling of control, participation, and risk perception. It will be important for developers to consider their approach to community engagement as development of the airport and surrounding urban growth area will continue over the next 50 years. The HIA provides recommendations to improve community engagement practices that may be relevant to other airport and large urban development projects. Hirono K, Haigh F, Gleeson D, Harris P and Thow, A M. Negotiating healthy trade in Australia: Health impact assessment of the proposed Trans-Pacific Partnership Agreement. Liverpool, NSW: Centre for Health Equity Training Research and Evaluation, part of the Centre for Primary Health Care and Equity, Faculty of Medicine, UNSW Australia, 2015. Reduce the concentration of public housing and increase the availability of affordable housing. Enable the formulation of detailed planning controls to achieve high quality urban design outcomes. Carless, F. & Gunning, C. (2011). Draft Residential Densities Strategy Mackay: Health Impact Assessment. Mackay Public Health Unit, Queensland Health: Mackay. The Mackay Regional Council area is one of the fastest growing in Queensland, with strong growth forecast over the coming decades. Managing the challenges associated with high population growth is one of the drivers of Council’s Draft Residential Densities Strategy which outlines its vision for more compact urban areas within the region. Recognition of the relationship between land use planning and health is not new and nationally there is much interest in translating this knowledge into practice. A tool which has emerged to contribute to this practice is Health Impact Assessment (HIA), a process which engages decision makers to consider health impacts in their planning, policy and program deliberations. To identify indirect health impacts that may be associated with the Draft Residential Densities Strategy, Queensland Health initiated a Health Impact Assessment with assistance from the Department of Communities, Mackay Regional Council and the Centre for Health Equity Training Research and Evaluation. Using a rapid HIA process, including collection of data via literature review and stakeholder consultation, and development of a population profile, the HIA project team generated a set of recommendations. This prospective desk-based Equity Focused Health Impact Assessment (EFHIA) aims to examine the equity issues relating to Marang Dhali Eating Well (MDEW). MDEW is a locally designed Aboriginal food and cooking program to improve food security in four Aboriginal communities within the Western New South Wales Local Health District (Western NSW LHD). This EFHIA makes predictions about the potential health impacts of MDEW and recommendations to maximise health gains and minimise health risks. Australian Indigenous Doctors’ Association and Centre for Health Equity Training, Research and Evaluation, UNSW. Health Impact Assessment of the Northern Territory Emergency Response. Canberra: Australian Indigenous Doctors’ Association, 2010. The Australian Indigenous Doctors’ Association (AIDA), in collaboration with the Centre for Health Equity Training, Research and Evaluation (CHETRE) at the University of New South Wales (UNSW) and with financial support from the Fred Hollows Foundation, undertook a health impact assessment (HIA) of the Northern Territory Emergency Response (NTER). The purpose of the HIA is to predict what are likely to be positive, negative and/or unintended health consequences of the NTER, using a combination of evidence from a variety of sources. The measures of the NTER outlined in the legislation, in associate media releases, and the NTER: One Year On report (Department of Families, Housing, Community Services and Indigenous Affairs, 2008) were assessed for their predicted health impacts based on the findings of community meetings with more than 250 Aboriginal people living in the prescribed communities, interviews with 25 Aboriginal and non-Aboriginal stakeholders, and a series of commissioned expert reviews. This report details the Goodooga community’s equity focussed health impact assessment of the Goodooga Health Service Review. The review was commissioned in late 2008 by GWAHS to inform proposed changes to the Goodooga Health Service (GHS). A Steering Committee was established in July 2006 to conduct a prospective HIA on the Redevelopment of Liverpool Hospital. The focus of this project was on the construction phase of the redevelopment and the scope covered four issues – reduced parking for staff, patients and visitors; health and wellbeing of staff and the community; community and patient safety (non-traffic related); and increased traffic in the area (general and construction traffic). Recommendations were developed for the Executive User Group (EUG) and these are currently being monitored by the EUG. Abstract: A health and social impact assessment of the South East Queensland Regional Plan was undertaken in 2005 (Queensland Government, 2005). It is one of few attempts nationally and globally to apply health and social impact assessment to a regional planning process. The assessment methodology builds on existing evidence-based research, methodologies and the combined professional experience of both health and social impact assessment practices in Queensland. The approach adds further strength and rigour to planning strategies to enhance the health and well-being of communities. The way the South East Queensland Regional Plan is implemented, and how the plan influences access to jobs, education, affordable housing and social infrastructure, and the achievement of social inclusion and connectedness within communities, will be central to future health and well-being of people in South East Queensland. (EFHIA) undertaken on the South Australian Program Reference Document of the School and Community Based Activities under the Australian Better Health Initiative 2006-2010. The EFHIA focussed on four components: Regional Healthy Weight Coordinators, the Healthy Ways project in Aboriginal communities, CYWHS parent focused project, and professional development to support these initiatives. In November 2008 a Rapid Desktop Health Impact Assessment was conducted on the Flinders Street Redevelopment project by the Health Promotion Service of the Tropical Population Health Services, Population Health Queensland. The identified health determinants were safety and security, access for all ages and abilities, social connectedness, participation and identity. This report outlines the methods and findings from the Hunter New England Area Health Service’s (HNE AHS) ‘Good for Kids. Good for Life.’ program (Good for Kids) Health Impact Assessment (HIA). The HIA was completed in the period December 2006 – August 2007 and was implemented under the direction of a Good for Kids HIA working party and staff of the Good for Kids program. As an HIA development site, the working party and program staff received additional support from the University of NSW Research Centre for Primary Health Care and Equity (CHETRE). The purpose of the Good for Kids equity-focused HIA was to improve the equity with which the program was delivered to Aboriginal and non-Aboriginal children. The use of HIA’s in Aboriginal health contexts has been limited, so the HIA working party took the opportunity modify the HIA so that it better reflected the principles of Aboriginal Health. This involved drawing on equity-focussed HIA methodology, learning from HIA’s completed in indigenous communities overseas and adopting an Aboriginal model of health. This report explains the Health Impact Assessment (HIA) process and presents the findings of the HIA of the Lithgow City Council Strategic Plan, 2007. The primary output of the HIA is a set of evidencebased recommendations geared to informing the decision-making process. These recommendations aim to highlight practical ways to enhance the positive impacts or minimise any negative impacts on health, well being and health inequalities that might arise or exist in response to the Lithgow City Council Strategic Plan. The Lithgow City Council Strategic Plan is the first long-term plan to be developed by Lithgow City Council in collaboration and consultation with the community and government. It introduces a new framework of strategic planning in the Lithgow local government area, which is driven by the community’s vision and issues. The Plan incorporates the visions and strategies and feeds these into Council’s management and operational plans to deliver actions that ultimately achieve the vision for the community. The objective of the Strategic Plan is to provide the strategic framework for the future development of the Lithgow Local Government Area and to encourage environmental, economic and social sustainability (Lithgow City Council Strategic Plan, 2007, Page 4). The way we design our cities has been shown to have an impact on health. Health Impact Assessment (HIA) provides a systematic process for identifying the positive or negative impacts that could arise from proposed policies, programs or projects, such as local government planning proposals. A HIA was conducted by South Eastern Sydney and Illawarra Area Health Service, and Wollongong City Council on the Wollongong Foreshore Precinct (WFP) Project. The potential impact of the Project on physical activity, social cohesion and access to healthy food were assessed. In May 2007, the NSW Government released detailed draft plans to develop 12,000 new homes in Sydney’s south-west – with construction to start as early as 2008 in Oran Park and Turner Road. It is anticipated that these plans will create healthy communities for families, with a mix of housing, jobs, schools, parks, transport, community facilities and shops. These precincts will offer a choice of accommodation including houses, terraces and units, to cater for singles, families and seniors. The Oran Park & Turner Road precincts are expected to provide 7,700 new jobs for Western Sydney – helping to achieve a key State Plan priority of more jobs close to home. Oran Park and Turner Road precincts are located in the Camden Local Government Area (LGA). 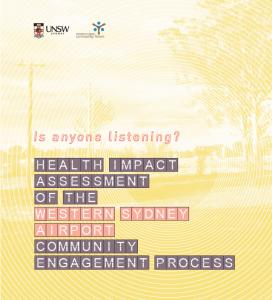 Sydney South West Area Health Service (SSWAHS) has been involved in the Greater Western Sydney Urban Development HIA with Western Sydney Region of Councils (WSROC) and Sydney West Area Health Service (SWAHS), which assessed aspects of the Sydney Metropolitan Strategy. The Oran Park &Turner Road Health Impact Assessment (HIA) is seen as a valuable extension and application of this previous project. People’s health is influenced by the built, natural and social environments in which they live. Local governments have a crucial role to play in creating environments that promote opportunities for wellbeing and active living. The North Coast Area Health Service and the Coffs Harbour City Council have worked together on a HIA to ensure future plans for the Coffs Harbour Local Government Area consider how the community can make healthy choices the easy choices. The project is supported by the UNSW Centre Health Equity Training, Research and Evaluation (CHETRE). The village of Bungendore is located in the Southern Tablelands of NSW within the Palerang Council local government area. It is estimated that approximately 2000 people now live in the village. Recent population growth in Bungendore has highlighted the need for the provision of services for current and future residents. Planning for Bungendore’s future is especially important and planning processes are currently underway. Feasible and sustainable development outcomes will be examined in this process. In this report, two growth scenarios have been evaluated that investigate the implications of future growth on the health of its residents.